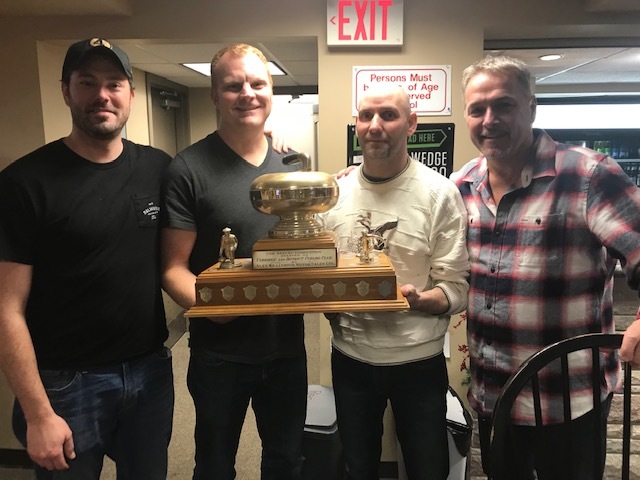 The 2019 Steak Bonspiel was once again a great day of exciting curling and great food. 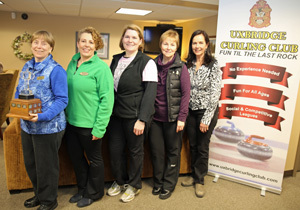 This year's winners were from the Annadale Curling Club. 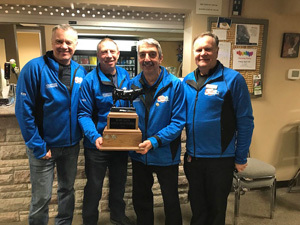 Congratulations to skip Dave Gaudette and the rest of his team - Carl Vickers, Geoff Peck, and Scott Edwards. Of course we need to thank behind the scenes work by kitchen chief Gaye Burnett and her crew and Derek Marques for once again putting in a great deal of time as spiel master. Our own Ray Grant has stepped forward to sponsor the second of the two annual Uxbridge Mens Masters Spiels (age 60+) and in addition has provided a trophy. We appreciate his generousity. 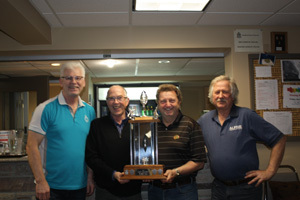 The second annual Ray Grant Masters Spiel was enjoyed by all those who competed again this year. Congratulations to the winning team from Uxbridge. Shown from left to right are Skip Tim Lofgren, Lead Norm Preston, Vice Glynn Bayliss and Second Rick Oldham. the kitchen crew of Cheryl McClymont, Brenda Kelly and Janet Markham. ice assistant Andy (a.k.a. Hemps) Hemphill and as always our ice maker Don McGregor. Great feedback about the roast beef dinner and much talk of “the great ice conditions!”. 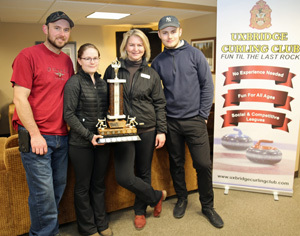 The annual Cowspiel winners this year hailed from way up in Huntsville. Dave Rigby, Wayne Watkins, Dale Heiydt, and Ron Kreutzer made up this strong and well dressed team! Well done fellas. Several "Thank you's" to pass along. Our own Randy Grant sponsored the event (Randy Paints). Sponsorships like this really help make these bonspiels work. Make sure to touch base with him if you need some painting done! Derek Marques for not only organizing the day but for also scrambling during the last week to do his best "(as always) to fill the draw. Sara Campbell organized a band of merry helpers in the kitchen to make and serve all the food. Of note, several visiting teams noted how surprised they were that we could have so many volunteers to help out at all of our spiels. It is simply the way it works at our amazing Club. Mark April 12, 2019 in your calendar! The closing party will be held at the Seniors Centre, Uxbridge. Cocktails at 6 p.m. and dinner at 7 p.m As usual, the awards and dance will follow. Tickets will be on available in late February. 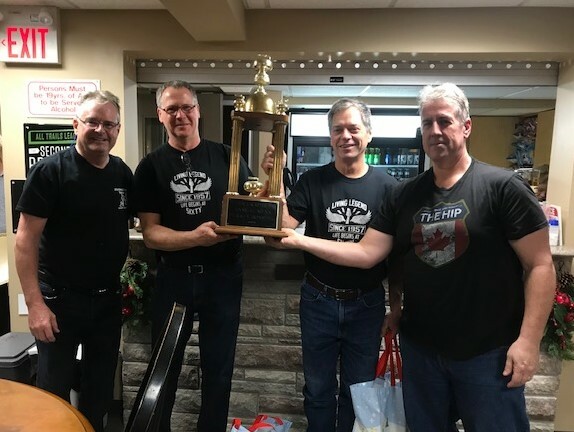 The 2019 T-bone Bonspiel was once again a great day of exciting curling and great food. 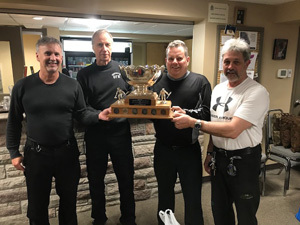 This year's winners were the 2018 winners as well from the York Curling Club. Congratulations to skp Mark Shephard and the rest of his team - Ryan Davies, Shawn Janes, and Wilf Wilhelm. 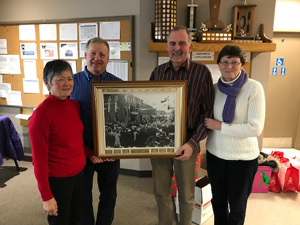 Marg McKnight once again organized the amazing kitchen crew and Larry Bertuzzi was welcomed back to be chief drawmaster for the day. 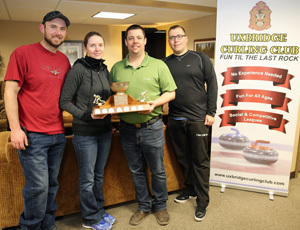 Two solid draws competed for the coveted Turkey Spiel trophy this year. Both draws saw heated battles between very good teams. 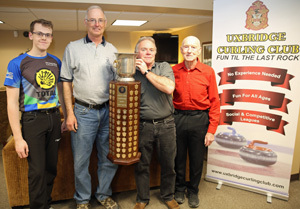 This year the eventual winners were from the Unionville Curling Club but you'll recognize these guys. Skip: Jim Bell brouight along Scott McPherson, Ray Leroux and Dave Blanchard all brought their "A" game. Behind the scenes, Pam Norton was the crew chief in the kitchen with several wonderful helpers. Super Draw master Derek Marques kept the day moving along to its conclusion. Have a cell phone? Try the App! Our provider has developed a simple free app that can be installed on your phone. Go to the "Play Store" -Android or "Apple Store" - IPhone and download "Curling Club Manager". All you'll need to do then is choose our Club from the drop down, put in your website username and password and you're all set. It is an easy way to check out when your next game is. You can even set up reminders there.